This is a picture of the giant hog weed from last year on George Street. At this stage, it is going to seed. It should not be allowed to get to this stage and spread. They can grow to be 10-15 feet tall, and the leaves are very large. The plant is extremely dangerous and people should not touch the sap; blistering will follow. If you suspect the presence of the plant, do not try to remove it yourself. Call the Northport Town office, 207-338-3819, and they will get professionals to come deal with it. NORTHPORT, Maine — Last summer, two very unwelcome out-of-towners put down roots in the village of Bayside, until locals got rid of them in the dead of night. It wasn’t a matter of xenophobia. 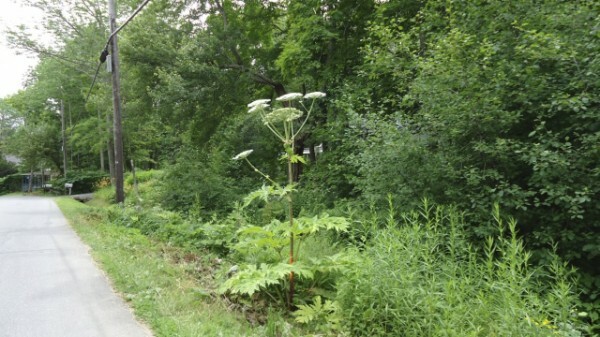 It was a matter of safety, according to town officials who are asking residents to keep a close eye out this summer to see if there’s been a return of the intruder: giant hogweed. The noxious plant’s sap is an extreme irritant. When skin touches the sap, the results can be painful blisters and burns that can cause permanent scarring. Contact with eyes can cause blindness. When the large plants were spotted last summer on George Street, the main route for Bayside village, it caused consternation for many who live in town. Giant hogweed is a native of the Caucasus region of Asia, and can grow up to 14 feet tall or higher. Its leaves are several feet long and stems measure as much as 4 inches thick. But the flowers are the plant’s most remarkable aspect: white clusters that can measure 2 feet across. Because of those flowers, hogweed can be mistaken for angelica or cow parsnip. But those plants do not grow as big. “It’s a really spectacular and very large plant,” Ann Gibbs, state horticulturist with the Maine Department of Agriculture, told the BDN last fall. At that time, the agency had documented at least 20 sites around the state with giant hogweed, including the Bayside site. About half of the sites are located in Hancock County, including several in Acadia National Park. The plant used to be popular with estate owners who searched for exotic plants from around the world to fill their ornamental gardens, experts have said. Now, state and federal agencies are working to eradicate giant hogweed, which generates a large crop of seeds each year, making that work a challenge. Lindahl is hoping that if giant hogweed is spotted again in Bayside, or elsewhere in Northport, landowners or concerned gardeners won’t take it upon themselves to cut down the plant, as happened last year. She said that she did not hear of any giant hogweed-related injuries last summer, though the Maine Department of Agriculture gave a heads-up to Waldo County General Hospital just in case. She and other town officials vehemently disagree. “We’re trying to nip it in the bud this year,” Lindahl said. Northport residents who spot giant hogweed can call the town office at 338-3819. Around Maine, sightings should be reported to the Maine Department of Agriculture at 287-3891.